Sorry guys, I should have replied to say I'd meet you there. Wow, the difference in the sea conditions between Brighton and Pebble Beach is amazing, it looks like it's almost surfable down there. Well Pete, it sounds like you got a sail in yesterday arvie. Sorry I couldn't sail with you but this bug nailed me, I've ended up sleeping all morning today and woke up at 2:30 this arvie and I think I'm back in the game again now. Looks like another southerly coming through on wednesday for anyone keen on sailing Sandstone, I know most of the crew are up at the lake with Jeff. Cool, looking forwards to catching up again Jeff, you guys have had an awesome run of wind up there by the sound of it. We'll keep an eye on the forecast. Wednesday is looking a bit suss Jeff, we might have to put it off till Thursday? It's been another couple of lovely days at the beach at Sandstone Point. Yesterday arvie it was great to have both Pete and Jeff back at the local for a sail, the wind was nice when we first got there which was great for this young bloke and his kite but there wasn't enough water to sail yet and then it died off slowly as the tide came in. I gave Pete's old 7.5m sail a go in the lighter conditions and loved the extra power, however it was pretty old and fragile and so after a few runs and a bit of tuning assistance from Pete, I came down on it and it just shattered with a huge rip in it. I loved the extra power in the light conditions but soon discovered that my 42cm fin for the shallow water was nowhere near big enough so I've learnt for next time anyway. This morning it was Jeff, Pete and myself with Tony showing up for a late start, nice breeze early dropped off into lighter conditions again but gee it was nice to be on the water with a few mates and not stuck at work. It's looking like a very windy couple of southerly days coming up at Sandstone Point. >2m high tides in the early to mid afternoon so we should have enough water for a few hours either side. Adam, Pete and myself (maybe Jeff who's on nightshift) were thinking of having a Friday early afternoon sail if anyone's keen and maybe a Saturday early afternoon as well. Jeff and Pete are heading down to RQ on Sunday for what looks like a real fun day, however I could be a bit under the weather after a big Saturday night so might just stay local with a headache. Who's keen and what's everyone's plans? Probably can't make it for a sail as the Boss is busy. I might call over to say hi Saturday arvo, with junior in tow. Looks like a big one tomorrow, they'll be coming out of the woodwork for this one I reckon! ill be there after the open house at lunchtime, shouldn't need the big gear either. Who else is up fo it ? I'll head down for a look around 11 Pete because i'll have to head home by 2. Its blowing hard enough here at Beachy to move the outdoor lounges on the deck tonight, hopefully it settles down a little overnight. Redcliffe has brown arrows now. 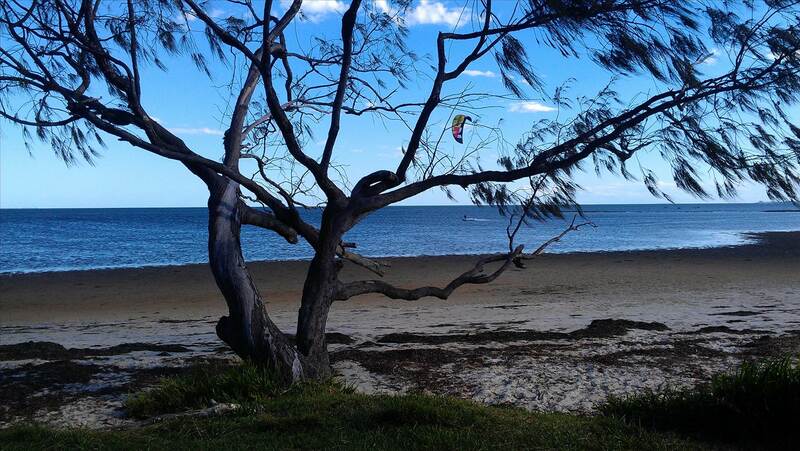 34 - 41 knots here at Redcliffe right now! Might see if I can make some rearrangements and try to get to Sandstone tomorrow. There won't be much water yet Tony because it's low tide right now. It's settled down heaps compared to last night but there's still plenty of breeze. I spoke to Adam last night and he reckons he's kayaking early then coming down around 1030 to 1100 too. See you there. Bwahahaha, break out the blocart. I'm about to drop the munchkin over with grandma and head down for a look, she didn't want to sit on a windswept beach in the spitting rain .............. what's wrong with kids these days? I got there just before 1pm to find about half a dozen boards out on the water and other guys rigging. John and Patrick raced up and greeted me like a long lost brother (thanks guys!). I rode the Mistral Flow 103L and later the Mistral Explosion 120L, both with the Severne Blade 5.7m. I felt like I'd gone back to windsurfing kindergarten. I think Tony was actually deeply concerned with the prolific, violent nature of my crashing and the time I spent floundering around in the water trying to get going again! I really kept trying to work on gybes, but never managed one successfully and they were the cause of many of my most stupendous crashes. I did end up a bit despondent. At the end, about 3pm, it really was too strong for the 5.7 and it would have been good to stay and change down sails, but I had to pack up and get back to other commitments. I nearly had a disaster with the board nearly being blown off the car ... very lucky escape. There really was a lot of wind. I was going flat strap at times, but only in a straight line and sometimes very temporarily. I can't wait till one day when I can turn around and keep going. On the Flow I was getting major fin spinout that sometimes I couldn't straighten up! Those were really excellent conditions and Sandstone is a great spot. A really perfect afternoon - the wind was solid and consistent. Great to see so many guys there ... Tony was going great guns, Jeff, Pete, and the other guys who's names I've forgotten or who I didn't manage to say Hi to. What a day, no photos though. Plenty of power with the 5.5m sail and even though I really needed to leave at 2pm I just couldn't drag myself away. Andrew's crashes had everything today, they looked spectacular and sounded even better but he was flying just like everyone else. My best day's sailing yet as one of the Sandstone learners and after only having windsurfed for a few months I jumped in the water cranked a perfect beach start and flew down the beach on the plane and in the straps so I'm very happy. Bring it on again tomorrow, good company and good times at our own little piece of paradise. Hey Tony, how did you re-grip the NXS? Fantastic wind again today. Wish I could get back out there and have another go (work the pain out of the bruises and sprains!). But I'm on carer duty and it costs to get someone to take over ... I spent up yesterday so I'll skip it today. Missed Sunday - went to RQ beach (had to fill in for Morgs :-) )- overpowered on a 5.8. Need to find me some solution to handling crashing across the chop? and 107L board. Definitely sore afterwards. Looks good for a NE on Saturday. With a bit of luck I will have a boom for my 7.3 and lighter winds by then. Does anyone have directions or map for the spot to sail in a Northeaster? Great that you enjoyed your time at sandstone. Welcome to the forum. I miss catching up with you on Saturday - too busy sailing . I think I met you up at Elanda? I believe golden beach also works in Ne but haven't experienced it and not sure of tides. G'day Wade and Jeff, it was a couple of good days sailing hey. High tides are from around 9am till midday over the next few days so it's morning sailing, although Jeff has shown us how you can sail off the sand spit at Turner's Camp on pretty much any tide which was pretty helpful. I've got to head into Brizzy on Saturday lunchtime so can only sail early but am working from home Friday and have got Monday off if anyone's keen. So on the current forecast it's looking like Turner's Camp Friday/Saturday and we'll be back over the Pebble Beach side for Monday/Tuesday if the wind swings SE. Hey Wade, punch Turner's Camp into your google maps and you'll see exactly where it is, it's another cracking good spot that Jeff/Pete have clued us into. Plenty of wind in the northern bay this arvo, Turner's Camp was great fun. The wind and chop was a bit of a challenge for me as well as hanging on when the bomb gusts came through but the more experienced guys Pete and Jeff were loving it and going fast. I think I'm shot to pieces for sailing tomorrow morning now but might see if I can get a late sail in off the sand spit tomorrow arvo if I'm home in time and everyone's still sailing. Cool, Tony reckons he was sailing today. Pete's out and Jeff and myself are maybe's. Looking like 10-15kn ESE over the next couple of days so maybe back to Pebble Beach. went to RQ beach this morning so that max could do the learn to windsurf - great morning.